Packed inside a soft padded and insulated bag with carry strap, this 1 Person 72 hour Commuter Survival Kit is ideal for travel by car, hiking or single people. This commuter kit comes in a blue insulated soft padded nylon bag with zippered top. It is a compact 9 x 6 x 6 inches which makes this kit great for travel or use as an office kit since it will fit virtually anywhere to be ready when needed. The insulated commuter bag with zipper top protects the contents from heat and cold temperatures while providing easy access. The carry-strap allows for easy carrying or tying it up (like in the trunk of a car or on a boat) so it will not move and be available when needed. 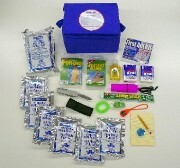 This commuter emergency kit was designed to provide essential survival supplies to sustain 1 person for 72 hours during and after an emergency.